•	Little is known about the mediaeval church of St. Mary, Newington, which stood on the west side of Newington. The list of rectors is, however, almost complete from 1212 onward. Presentations to the rectory were usually made by the Archbishop of Canterbury, and it was Cranmer who in 1546 granted the patronage to the king, so that the Prior of Christ Church was probably technically correct when he replied to Thomas Cromwell's request for the patronage, that it was not his to give. •	John Aubrey's History of Surrey, published in 1719, states that the church then standing was, except for the north aisle, which had been built by Sir Hugh Brawne in 1600, about 150 years old. •	In 1704 the parishioners at their own expense put in new pews and galleries but in about 1714, ten years later, during Sunday service a wall collapsed which caused the congregation to run out and in the confusion many were bruised and trodden under foot. Upon examination, the structure was found to be quite unsound. The church was entirely rebuilt, part of the cost being defrayed out of a brief granted for the purpose. •	Seventy-five years later complaints were again being made about the defective state of the walls and tower and practically the whole building had to be demolished. When the church was again rebuilt it was extended 25 feet further west and the floor was raised 2 feet. The building was awkwardly sited being, in the words of an early 19th century writer, "a protuberance obtruding on the highway," so, in 1876 it was pulled down so that a much-needed widening of Newington Butts could be made. The old burial ground still remains and in 1877, a clock tower, the gift of a churchwarden, R. S. Faulconer, was built there to mark the site of the old church. 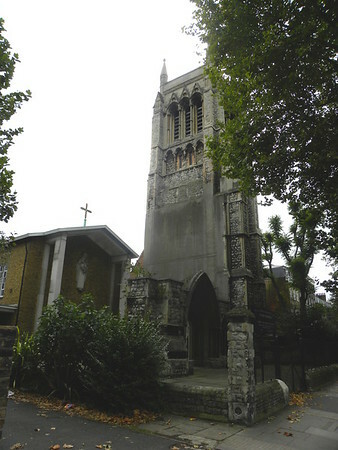 •	The new church, erected on the east side of Kennington Park Road from the designs of James Fowler, was consecrated in May, 1876. It was built of Kentish rag with Bath stone dressings in the Early English style, but the spire which formed part of the design was never erected. •	The church was burnt out in an air raid on 10th May, 1941. •	Standing in the forecourt of the present church is the portico fragment of the old west front and tower which Grade II listed. The new church designed by A. Llewellyn-Smith was built in 1958. The shallow pitched roof is copper covered and lower roofs are flat asphalt covered concrete.